Bit of a ramble! For those in a rush, it’s enough to know the first attempt for North American viewers sits in the comments below. Update: just a quick one further to some questions/notes below, light painting is basically waving a torch (or other lightsource) around in front of the camera during a long exposure. This leaves the trails of light you see above! 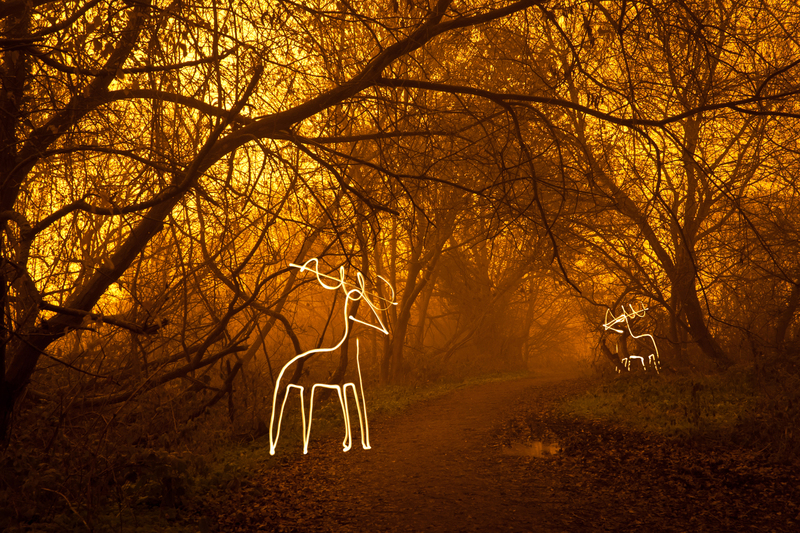 The deer were created in camera this way – not an edit! Since delighting myself with my first light painting Love At First Light, I’ve lined up a number of other light paintings I’d like to try. A few weeks back I got the chance for a second session, but having invested in an overpowered Halfords torch (the torch I used first time round was borrowed) couldn’t tame the light and just got flare. A visit to a £1 shop later and this is my third light painting session, the second shot I’m happy enough to post. I’ve had this in mind for a few weeks, but not seen the right place for it. This evening I was out in the heavy fog shooting some Mars like images (to follow) when I found the fallen leaves had made the setting I was after. So with Christmas closing in all too quickly, I gave it a go! I took a few images to work out the reindeer (the first attempt ended up as a moose, posted in the comments for North American viewers), and then added the second reindeer at first take. By way of side note, the moose is around a 2/3 stop shorter exposure, and the colour isn’t quite as cool as a result. Normally I shoot night time long exposures at ISO 100 to tame the noise on the 300D, but it was so dark in the forest that this needed a twelve minute exposure (729 seconds ¦ f/8) at ISO 200. With each exposure something of a dice roll due to the reindeer, I felt the noise was an acceptable trade off to avoid 25 minute shots! It’s a very similar colour to the sodium cloud in www.flickr.com/photos/flatworldsedge/5182134181/, and the fog does a similar job with the street lighting. The introduction of the forest and the lack of any moon, however, mean that shooting at the same settings (f/11 ¦ ISO100) last night’s shot would have needed just shy of 50 minutes to get to the same place. Kind of interesting, to me at least, sorry! Few other things. It was raining quite hard by the end, and the mist stayed very dense, so I’ve amazed the torch didn’t pick up droplets or flare more – it is very cheap (and dim) and I guess 12 minutes gives a lot of tolerance. I used an A4 sheet of bubble wrap I keep as padding in the end of my bag as a makeshift camera cover; an innovation I can recommend. I just need a red light to add the festive nose next time round. For now, I’m afraid you’ll have to imagine it. Hope you’re all having a great weekend and you like the image. Thanks for looking and indulging my ramble!